Many of our supporters want to know which candidates want to STOP the CHOP. While we are not endorsing any candidates, we can tell you that both Sen. Lesniak and Asm. Wisniewski oppose logging on Sparta Mountain. District 24 Democratic candidates Trish, Matteson, and Pirog explained their opposition to the logging in their recent debate, covered by the NJ Herald (go to 45 minutes into the recording). Friends of Sparta Mountain recorded the meeting and will be posting the video on Youtube. Check out the slides from the DEP presentation and the coverage in the NJ Herald (articles on 5/10 and 5/11) and the Sparta Independent. Division of Fish and Wildlife’s David Golden gave a 20-minute presentation highlighting the changes in the 10-year plan, which were mostly clarifications with a few exceptions: there will be 100 foot buffers from private property lines, and 300 foot buffer from clearcuts for category 1 streams. NJ Audubon’s Don Donnelly stated that he expects that additional land will be logged under the next plan, to maintain 10% young forest (as opposed to logging the same areas again). (Note that this approach results in logging at least 60% of the WMA over time.) Regarding the new NRCS soil maps that show that the WMA is at high risk of damage for many aspects of logging, Donnelly stated that these maps are intended for larger logging activities, unlike those planned for Sparta Mountain. (So they really have no useful soil analysis.) Regarding practice plans for DEP logging activities, the DEP will make the plans available for public review, not comment. Stakeholders will not have input. Sign up for the DEP mailing list and check out the updated plan (the plan is the first 84 pages with a plan summary at page 65, and the rest is appendices). The new Appendix 17.7a shows that 78% of the WMA is a severe erosion hazard for roads and trails, 73% is highly susceptible to site degradation, 94% has low resistance to soil compaction, 93% is a severe rutting hazard, and 90% is poorly suited for log landings. NEWS FLASH: Sen. Lesniak makes good on his promise to STOP the CHOP by introducing two new bills. See the NJ Herald’s front page article for details! One bill (S3043/A4647) removes the Highlands Act exemption for forest stewardship plans on public lands. The second (S3044/A4646) requires forest stewardship plans on state-owned lands to use rare species and habitat data to make sure that they help more rare species than they harm. Thanks to Sen. Bateman and Asm. McKeon for co-sponsoring! Contact your legislators and ask them to support bills S4043/A4647 and S3044/A4646. Help STOP the CHOP by signing our petition and putting up a STOP the CHOP lawn sign! The State of New Jersey wants to sell out Sparta Mountain Wildlife Management Area to commercial loggers, grouse hunters and other private interests. THEY MUST BE STOPPED. Under the guise of “forest stewardship plans,” State bureaucrats are trying to raise money by permitting clear cutting, herbicidal and fire use, and the degradation of our water supply and other natural resources in our public open spaces. Sparta Mountain, like many other public open spaces, is home to many rare and endangered plant and animal species. The proposed Sparta Mountain logging plan would cause irreparable damage to the complex wetland systems and pristine Category 1 waters (the highest classification in the State). The Highlands region, which includes the Sparta Mountains, also provides the drinking water to over 70% of ALL NJ residents. This plan sells out New Jersey’s public lands and parks which belong to all of us and are held in the public trust. They must not be sold to the highest bidder. Don’t let State bureaucrats destroy our forests, endanger our water supply and decrease our property values. They’ve already logged 58 acres! 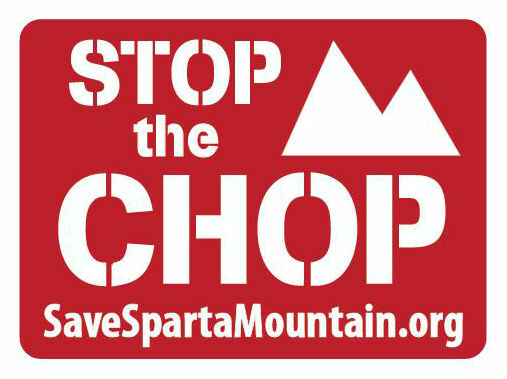 Help stop commercial logging on Sparta Mountain before it’s too late!